This is a crosspost from my 180 photo blog. 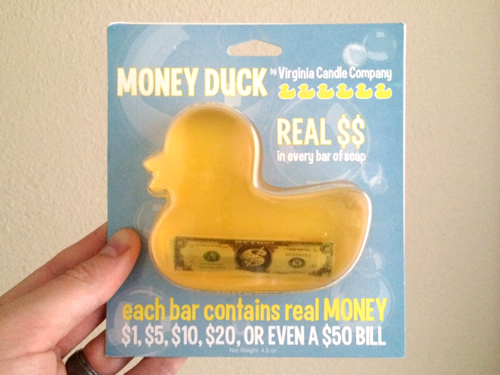 If you haven’t read Dan Meyer’s take on the Money Duck, go ahead and read up. Student Alpha: That’s really annoying that they didn’t show the price. So the pump was nicely primed. I gave out Dan’s handout and each group of 2/3 worked through it independently and I went around and poked and prodded with questions. B can’t be possible because they add up to more than 100%. Student Beta: C is the one from the video. Student Gamma: D is also possible from the video. Student Delta: I feel like A would be bad because no one would keep buying ducks. Student Epsilon: But B would be bad because you’d be losing money. The students had an easy time sorting out the most and least likely to buy for $5 (by eyeing it), but a difficult time sorting out the two middle positions. I’d say the groups were evenly split at the guesstimate for sorting the middle two. I went around to each group and asked how they sorted, and mentioned that it’d be nice if there was some way to formalize the guesses. About half the groups got calculating right away without giving a gut guess (on question 5). I didn’t help out with question 6 unless asked, just put the expected value formula up on the board. Most groups figured it out on their own. When they came up with those three things they either entered in the information at my teacher computer, or on my chromebook. When they were finished with entering in the information I asked them to step away from their companies goal, and become individual buyers of the soap. Which would they buy… and why? Interestingly a couple of groups either went down the route of a non-profit (but not really) corporation, or they didn’t understand how to properly set a price for their soap. Nice activity, a nice extension might be to go from the theoretical to the empirical world by actually “making” the ducks, and seeing how the gambling buying of the soap actually turns out. Thanks for sharing! I used this lesson today, and it was very engaging. I also had kids choosing impossible/possible based on the video, so I’m considering skipping the video when I use this with my B day kids tomorrow. I wonder how I could make the directions clearer or what to say/do to get them to think in general and not specifically about the video. Awesome! Do you think it’d be useful to actually open one of the suckers at the end of the lesson?